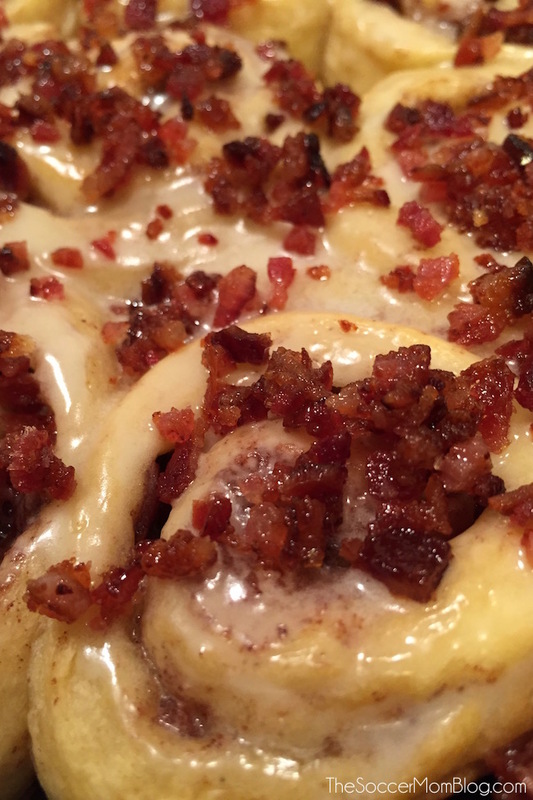 Pillsbury Cinnamon Rolls with Candied Bacon …need I say more? 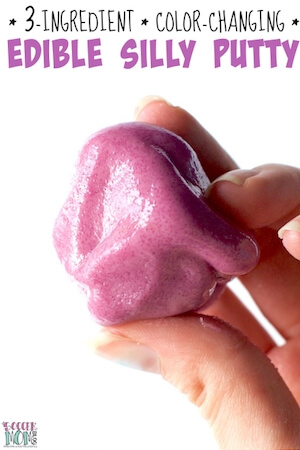 This dessert is almost too delicious for words, and it’s EASY! Fall is my favorite season and November is my favorite month of all! Thanksgiving, my birthday, my wedding anniversary — there are so many reasons to celebrate and be thankful. Our family traditions include classic recipes that we enjoy together every year. For me, very few things bring to mind Thanksgiving and family like my Granny’s famous cinnamon rolls. 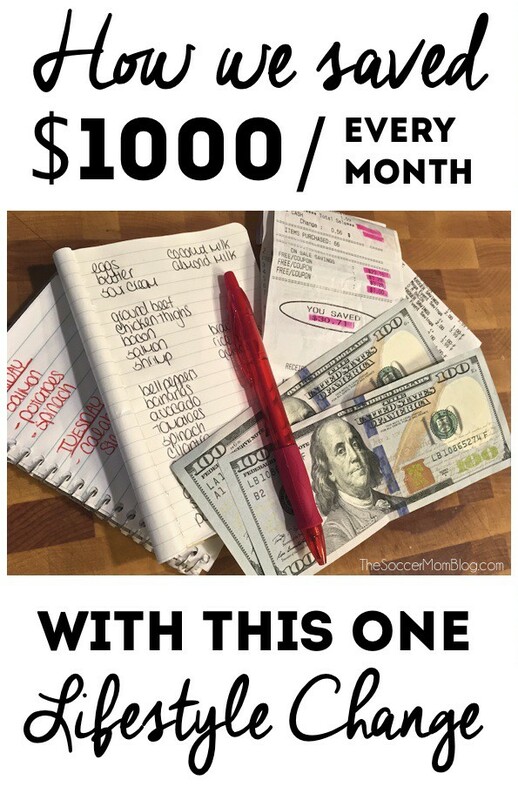 However, Granny’s cinnamon rolls are made from scratch, so they are a bit time-consuming and not exactly the easiest recipe for a beginner (aka ME) to attempt. The best part? 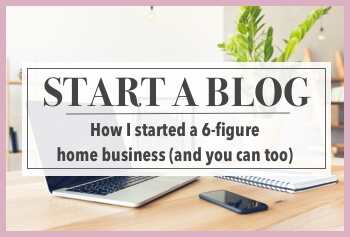 This recipe is SO easy that even a novice can handle it, and your guests will think that you’ve been slaving away at the oven all day. STEP ONE: Preheat oven to 375°. Lay strips of bacon on a foil-lined baking sheet. When oven is up to temperature, place baking sheet in the oven and set the timer for 15 minutes. STEP TWO: When the timer dings (and 15 minutes has elapsed) remove baking pan from oven. Paint bacon with a mixture of 2 TB brown sugar and 1/4 cup maple syrup. 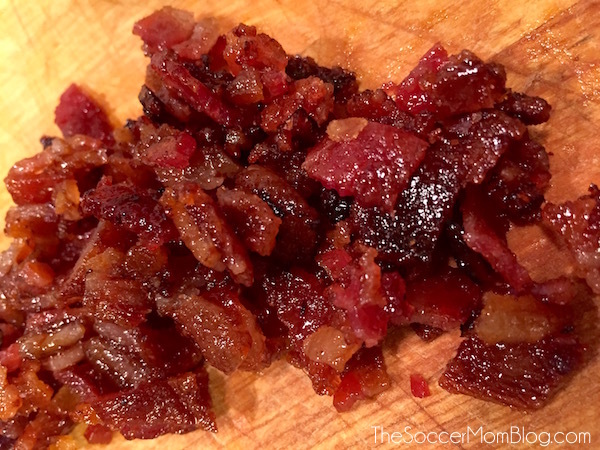 Return bacon to oven and cook for 15 more minutes, until crispy and caramelized. (Oven times may vary, keep an eye on the bacon and remove when it starts to turn a rich brown). STEP THREE: When bacon has finished cooking, set aside to cool. Reduce oven temperature to 350°. STEP FOUR: Once bacon is cool enough to handle, chop into small pieces. 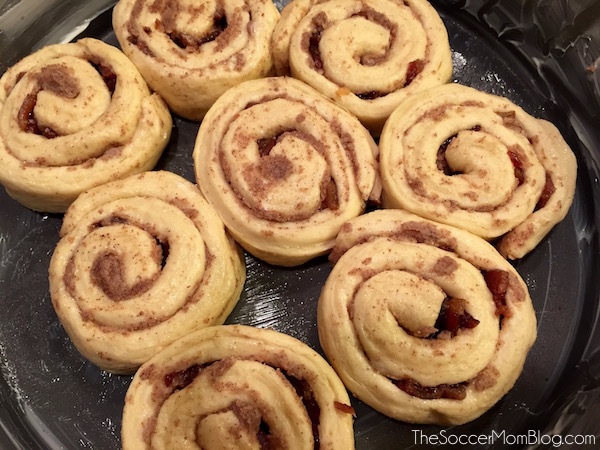 Unroll each cinnamon roll, place a few pieces of bacon along the inside (spaced about an inch apart) and roll them back up. (You should still have at least half of the bacon left over). STEP FIVE: Place cinnamon rolls inside a greased round cake pan and bake according to directions on Pillsbury package. 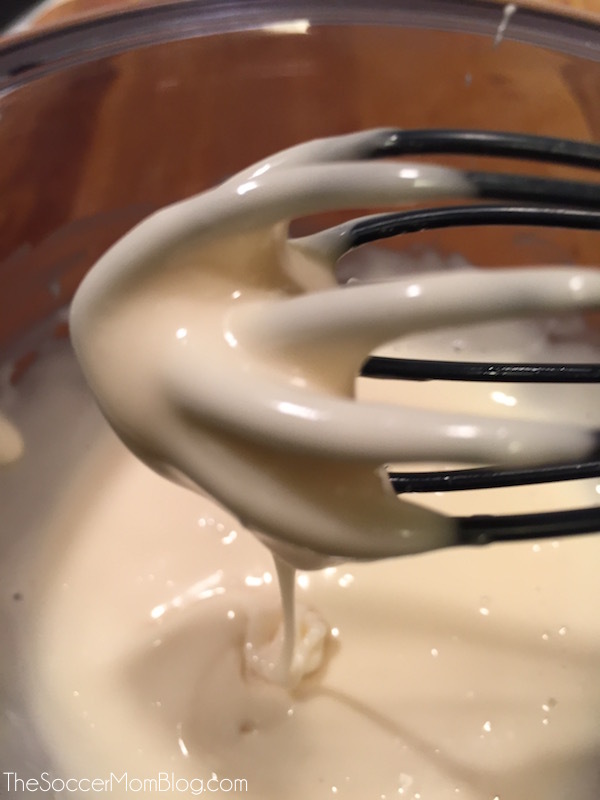 STEP SIX: While rolls are baking, prepare the maple glaze by whisking together the frosting that comes in the package with 1 tablespoon maple syrup. STEP SEVEN: When rolls have finished baking, remove from oven and coat with the maple glaze you just made. Sprinkle remaining chopped bacon on top. 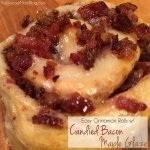 Jump start your day with these Easy Cinnamon Rolls that are topped with candied bacon and a sweet maple glaze! Preheat oven to 375°. 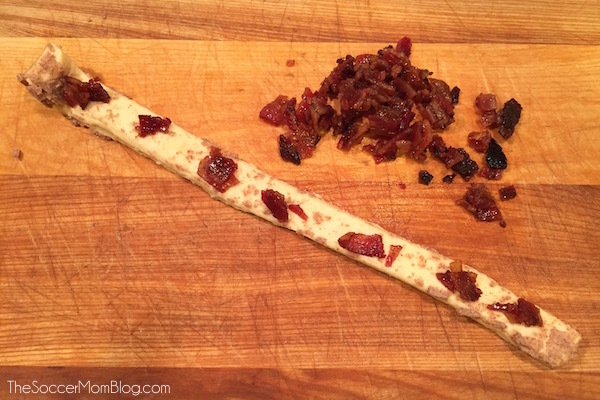 Lay strips of bacon on a foil-lined baking sheet. When oven is up to temperature, place baking sheet in the oven and set the timer for 15 minutes. When the timer dings (and 15 minutes has elapsed) remove baking pan from oven. 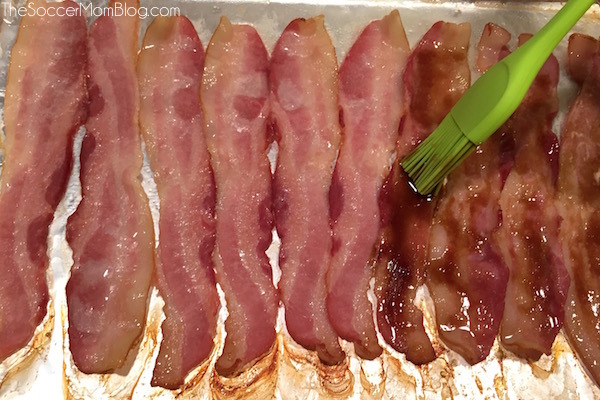 Paint bacon with a mixture of 2 TB brown sugar and 1/4 cup maple syrup. Return bacon to oven and cook for 15 more minutes, until crispy and caramelized. (Oven times may vary, keep an eye on the bacon and remove when it starts to turn a rich brown). When bacon has finished cooking, set aside to cool. Reduce oven temperature to 350°. Chop bacon into small pieces. 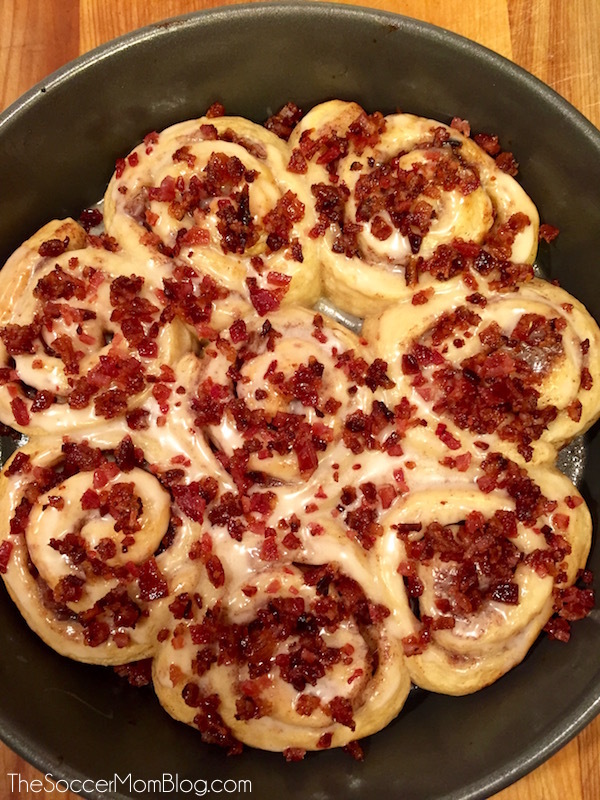 Unroll each cinnamon roll, place a few pieces of bacon along the inside (spaced about an inch apart) and re-roll cinnamon rolls. (You should still have at least half of the bacon left over). 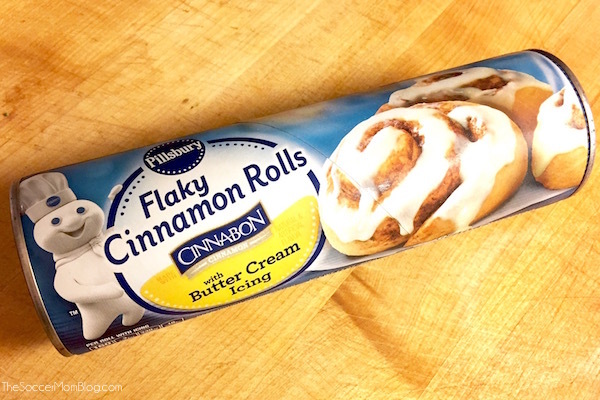 Place cinnamon rolls inside a greased round cake pan and cook according to directions on Pillsbury package. While rolls are baking, prepare the maple glaze by whisking together the frosting that comes in the package with 1 tablespoon maple syrup. When rolls have finished baking, remove from oven and coat with the maple glaze you just made. Sprinkle remaining chopped bacon on top. 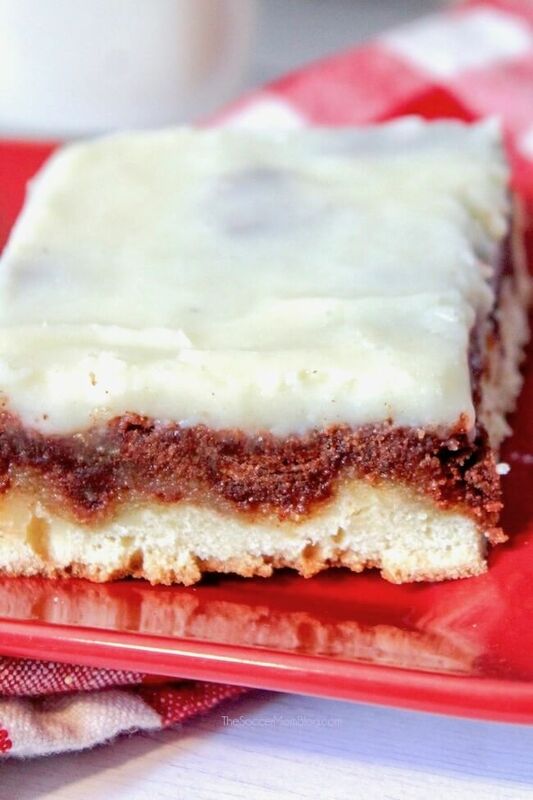 Try our easy Frosted Cinnamon Roll Cake too! 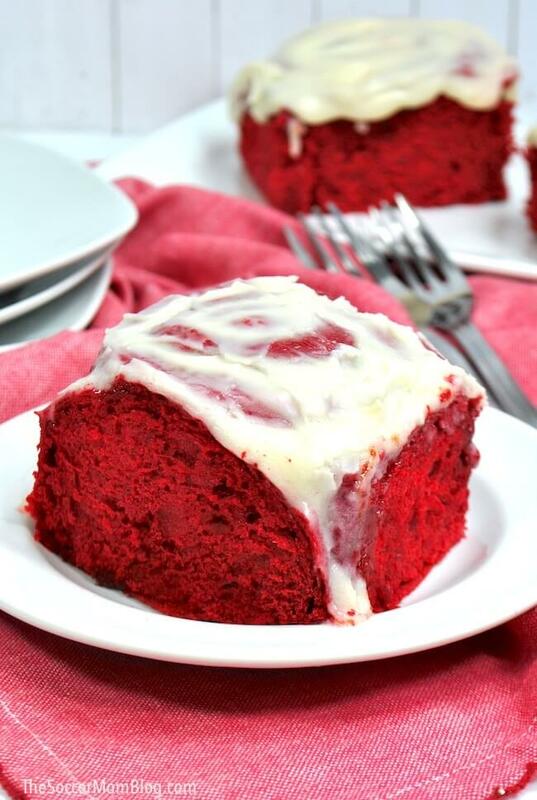 Our Red Velvet Cinnamon Rolls are perfect for Valentine’s Day! 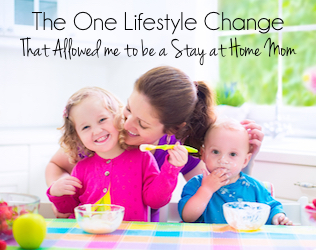 What are your family traditions? 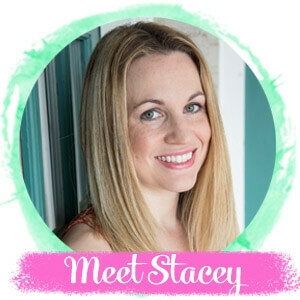 I’d love to hear what you’ll be cooking up this Thanksgiving!